A smooth, soft and flawless skin is most attractive. It not only makes you look beautiful but also makes your appear healthy and happy. However, with age and other skin problems, your skin may develop discolored patches, scars, etc, which tend to mar the beautiful skin you had in your youth. With cosmetic skin polishing technique, now you can restore the soft and healthy skin tone back. Cosmetic skin polishing, also known as ‘micro-dermabrasion’, is an efficient and excellent way to remove unhealthy skin cells and replace them with healthy, new skin naturally. This is a cosmetic technique that uses a special handheld device. This device has a round, rotating end which is made of a rough material. Once the device is switched on and the head starts rotating, the cosmetic specialist will gently apply the device over the skin to be treated. This effectively provides a way to exfoliate and polish your skin, as well as improving the lymphatic drainage from the skin. Am I an ideal candidate for Skin Polishing? Wish to restore your youthful, smooth and healthy skin. Wish to remove signs of ageing from your skin, such as age spots, acne and fine lines. Wish to undergo a non-invasive, non-surgical and quick cosmetic solution for soft and healthy skin, especially on your face. Are not suffering from any underlying medical condition that may worsen with this procedure. Are in overall healthy condition. Have a realistic outlook towards the end results of this cosmetic procedure. How is cosmetic Skin Polishing performed? Cosmetic skin polishing is an excellent and effective way to restore healthy, smooth and bright skin on your face. In this, the micro-dermabrasion device is used to gently remove the dead and unhealthy skin layers from targeted areas. The device consists of a vacuum attachment which gently pulls your skin towards the mouth of the device. The crystal dermabrasion attachment then begins to remove the discolored, rough skin using friction power. In this way, the unsightly upper layers of your skin are removed carefully. With natural healing, new skin begins to replace the removed layers. This new skin is healthy, soft and looks youthful too. Cocoona Center for Aesthetic Transformation is the top cosmetic care provider in India. 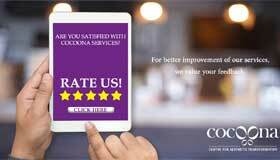 At Cocoona, a team of expert cosmetologists and cosmetic surgeons ensure world-class treatments for every patient. You can choose to get an effective, successful and highly affordable cosmetic skin polishing treatment at Cocoona. 1. How effective is cosmetic skin polishing? The cosmetic skin polishing procedure is highly effective and shows noticeable results. With this cosmetic technique, you can get back your healthy and attractive smooth skin faster and more efficiently. 2. Are there any complications or side effects of cosmetic skin polishing? As cosmetic skin polishing is a completely non-invasive and non-surgical technique there are no risks of severe complications after this procedure. You may notice some redness and your skin may feel sensitive. However, these symptoms disappear within a few hours after you undergo the procedure. 3. What is recovery like after cosmetic skin polishing procedure? There is hardly any time required to recover after cosmetic skin polishing procedure. As the procedure does not require any form of incisions, the recovery time is almost negligible and the cosmetic specialist may advise you to resume normal everyday activities on the same day after the procedure.